This Song Passage from the Title "Black Leather", the Band's album of the same name, makes it clear where the IRON HORSES journey goes, which path they have already gone and how connected they are to their Music. "Hell! What kind of High-calibre storey from Mecklenburg-Western Pomerania"
Sweat Driving, energetic and authentic, the Men around Frontman Sebastian "Babschke" Wegner are a real live hammer! So Band Names and Musicians merge into who you are, a Rock Act that captivates its Audience at Full steam like a steely Ross. 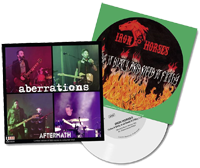 "The Iron Horses reduced Schleswig to rubble"
Whether young, old, Club or Festivals, Hits like "Desperados, Crash and Burn, The Steammachine, Stage On Fire, Punisher, Boneshaker or Black Leather" show what a great Songwriting is in the Band. Through their excessive live Shows, the Band always manages to take fans on a one-off Trip and leave the Boiling Point far behind. 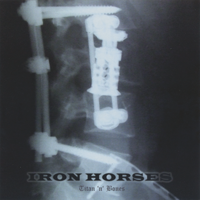 Iron Horses is a german Heavy Metal Band from the Baltic Sea. It was founded by Manuel Arlt, Sven Möller and Sebastian Wegner in August 2000. The current drummer Gino Roepke joined the band 2013. 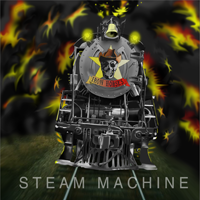 The Name Iron Horses is inspired by a local steam engine and stands for the trains wich travelled through the wild west of north america. The first LP Titan ’n‘ Bones appeared 2007, wich earned some excellent reviews in the press and took the band a big step forward. Because of this record the band played shows with Molly Hatchet,Rose Tattoo, Alice Cooper, Grave Digger and Doro. 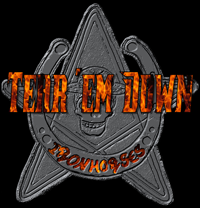 In 2013 the Iron Horses got a record deal with T-Rave Records and published the LP Black Leather. Bassist Ludwig Wabra joined the Iron Horses in 2015 and completed the line-up. „This band is definitely not boring“ because of the highly individual vocal performance by Sebastian Wegner and the powerful, always coming to the point, music of his band. Hard and agressive Rock’n‘ Roll, rooted in the eighties, with wonderful Blues influenced guitar solos. This mix comes along quite fresh. Very own! Very authentic! After the sudden Death of your Manager, the Iron Horses stood in front of a Pile of shards, racked up again and contacted Dieter Hecker of Ultra Music, whom they met in 2017 on the Megalith Open Air, who was there with his headlining band. So it was that Dieter became the Iron Horses new Booker & Manager, getting the Band back on Track. The Boys went to the Studio to perform the Black Leather Sequel, which is expected to be released in the Summer of 2019. With the R-EVOLUTION OF STEEL TOUR in March 2019 and other Festival performances at the back, such as the largest Russian Rock festival, the KinRock Festival in August 2019, which is still celebrating its 25th anniversary, the Band continues to show Presence. After the release of the New Album, it will hopefully go steeply uphill. New Videos are to be produced and maybe there will be several more Concerts in 2019. The Guys at Iron Horses are hot on many more Gigs anyway and are waiting in the Wings.